When Kerotin came to us, they were spending a lot of money in Facebook with only average results. They asked us if we could help improve the efficiency of their ad spend so they could make more money with the same budget. The results form the basis of this case study. There are some really important lessons to be learned here. 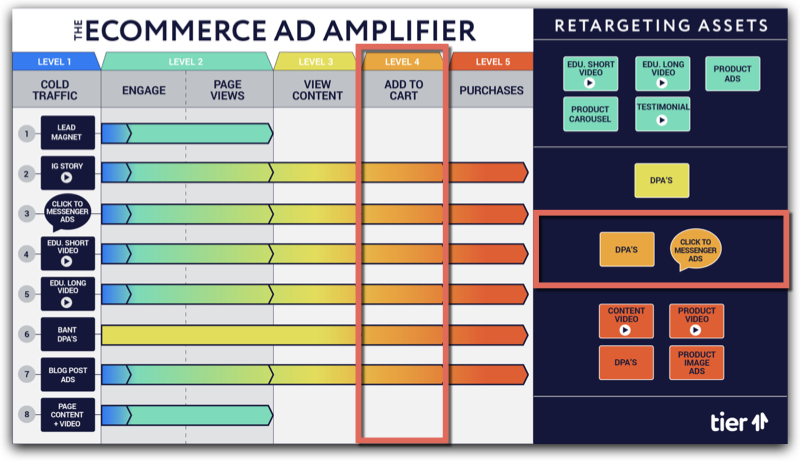 Like how a small tweak to your ads can cause a BIG increase in performance. Or the importance of testing many different timeframes. Or how an improvement in the efficiency of your retargeting ads can help you to scale up more profitably to cold traffic. Of course, a lot of work went into optimizing this brand’s accounts—much more than we can put in this article. But if we had to pick the handful of changes that gave us the most outsized results, we would narrow it down to these three big changes that really helped us to turn things around. Previously, this hair care brand was spending about $1,200/day on add-to-cart DPAs. And in our analysis, their results were hovering right around average. In other words, there was definitely an opportunity to improve. But before we get into the details of exactly what we did, let’s take a minute to make sure we’re all on the same page about the type of ads we’re talking about here. DPA stands for dynamic product ad. These ads allow you to display a carousel in the newsfeed that showcases a handful of different products. And the ads are dynamic, which means Facebook will automatically promote your most relevant items based on each individual user. DPAs are some of the most effective ads for eCommerce out there. We find them to be especially effective for retargeting people who have already visited the website. And in “Big Change #1,” we’re referring specifically to add-to-cart DPAs. In other words, these ads are being displayed to shopping cart abandoners—people who added a product to their shopping cart and then left without completing their purchase. Great. Now let’s take a look at how we optimized these ads for Kerotin Hair Care. The first change we made was to restructure the way those DPAs were being shown. And we started by testing different time & date ranges. We showed the ads to 3-day visitors, 7-day visitors, 30-day visitors, and everything in between. We soon learned that most conversions occurred within about 10 days. After that, the cost per acquisition (CPA) really jumped. So we used that information to help focus our DPAs during that first profitable 10-day period. Then we tested new ad creative. See how the copy focuses entirely on the discount? We thought we could improve conversions without it. A higher price-point could help give us a better ROAS. We didn’t want to train the audience to expect a discount. So we rewrote the ads to be more benefit-driven, focusing less on the cost and more on the healthy, shiny hair that these customers really wanted. No mention of a discount, just reminding the visitor of the benefit of using this product. 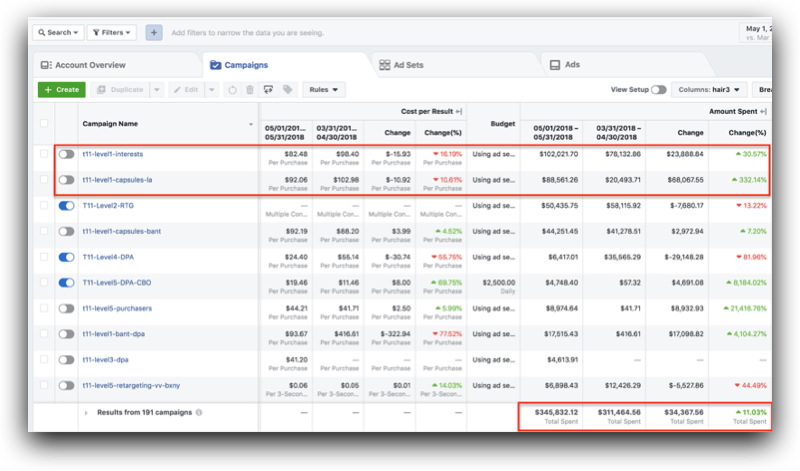 Originally, they were generating sales at a $48 CPA (cost per acquisition) and a 2x ROAS (return on ad spend). That’s just about a five-fold improvement, all from refining our message and showing our ads at the optimal time. The next place where we focused our attention was on Kerotin’s “View Content” DPAs. Previously, Kerotin was spending about $1,000/day on these ads with average results. We knew there was an opportunity for improvement there, too. What Are “View Content” DPAs? We’ve already discussed DPAs. But in “Big Change #2,” we’re targeting a different audience with these dynamic product ads. Instead of displaying them to shopping cart abandoners, here we’re retargeting people who viewed a product page but did NOT add a product to their cart. 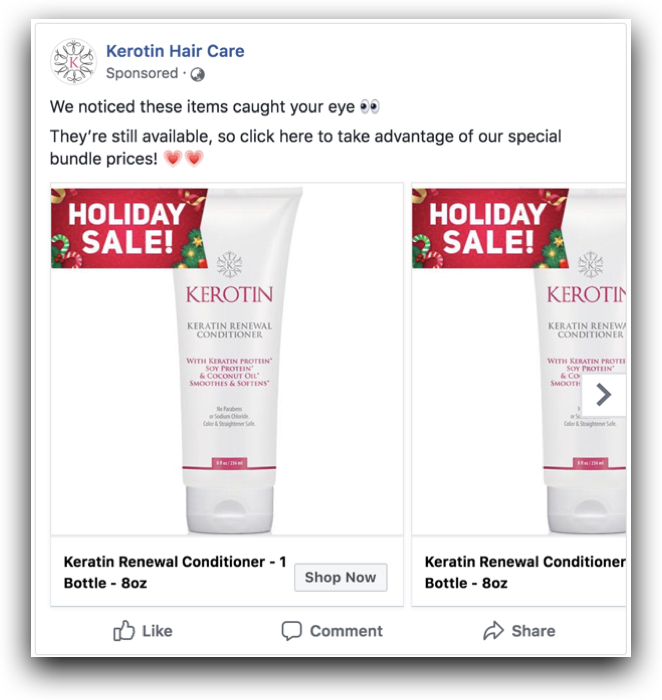 Once again, DPAs are a great ad format for this audience because Facebook can automatically display the products that the user showed the most interest in. Since we had already learned that most conversions happen in the first 10 days, we applied that same learning to these ads and saw an immediate improvement as a result. We also decided to write new ads that spoke more directly to this audience. “We noticed these items caught your eye” really works here because we know they visited the product page for these items. So how did these changes affect the results? This is more evidence that seemingly small changes can have a big impact on your campaign’s performance. The third big change we made was to take advantage of restock ads. If you sell any sort of reusable item that has to be purchased regularly—like toothpaste, supplements, water filters, light bulbs, etc.—then restock ads can be a super valuable way to generate extra sales by reminding your existing customers that it’s time to stock up again. This is relatively low-hanging fruit, but restock ads do still require some finesse to get right. Effective restock ads require careful placement and timing. If your product lasts 30 days, for example, you don’t necessarily want to wait 30 days before remarketing to them. Instead you want to reach them just before their stock runs out. 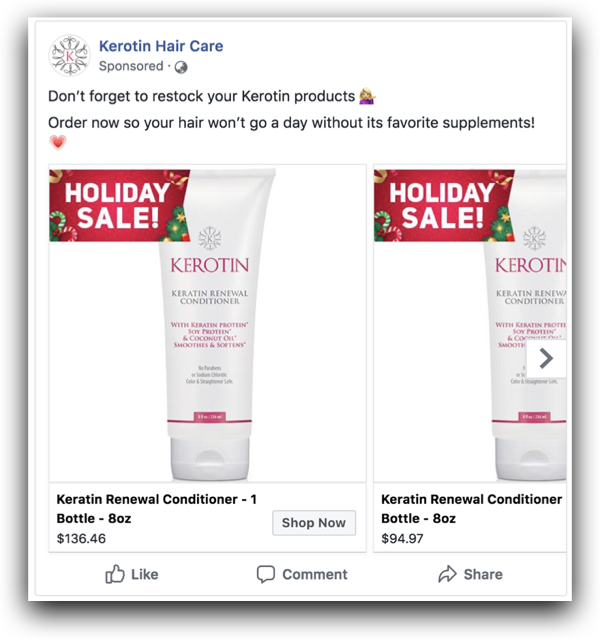 For Kerotin Hair Care, this issue was complicated by the fact that they sell a lot of 3- and 6-month bundles…which means these customers won’t be ready to buy again after just a month. So we did some testing, and arrived on a 60-day delay. This means we were getting in front of customers when they were getting close to being through with their supply. Remember that it’s usually easier to sell to current customers than to strangers. And if you have a product that runs out and needs to be purchased again regularly, reminding them when it’s time to restock is a great way to generate repeat sales. Another nice thing about these ads is that they will scale up with the rest of your company’s sales. The most new customers you generate, the more restock sales you’ll get as a result. 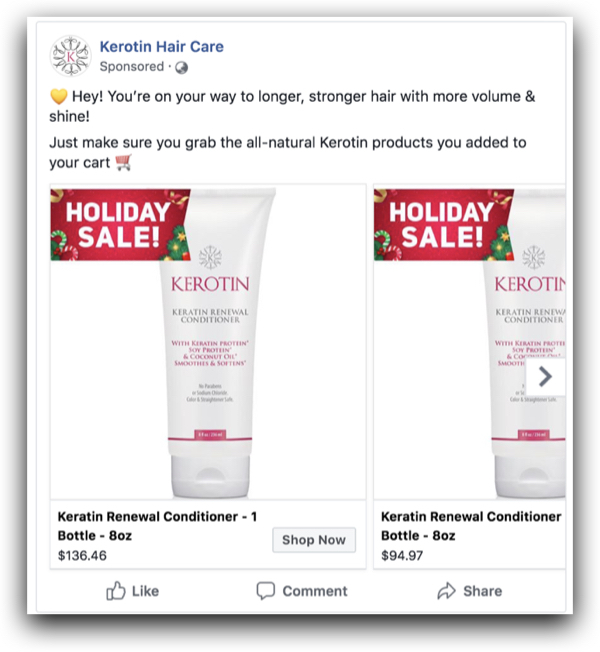 The 3 big changes described above helped us to get much more efficient with Kerotin Hair Care’s ad spend. We got more sales for less money through smarter retargeting. And that meant we could put more of their budget toward cold traffic. Running ads to cold traffic can be really difficult without a good retargeting system in place. 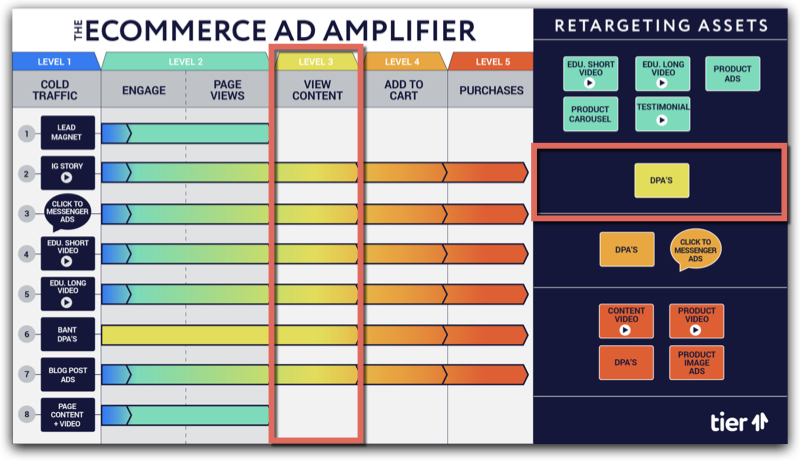 But when you have efficient retargeting ads waiting to re-engage and convert your visitors into customers, then spending money on cold traffic starts to make a lot more sense. And that extra traffic benefitted their ad campaigns as a whole. Now that we were getting more people through the funnel, our frequency dropped as our reach increased. In other words, instead of hammering a smaller audience 20 times each with retargeting ads, we were retargeting a much larger audience with a lower frequency of around 6x. This meant that the overall CPA and ROAS improved, too. We don’t want you to get the impression that we always do everything right here at Tier 11. Yes, we’re very good at Facebook & Instagram ads. As good as anyone else you’re liable to find anywhere in the world. But we’re human, and like everyone else we make mistakes and have room for improvement. We think it’s important to be honest about that, so that we always stay open to what we can do better next time. If we could go back in time and start these campaigns over, here are a couple things we would have done differently. #1: We would have consolidated more of our data. Early on with Kerotin, we moved some of their ads into separate campaigns. For example, we moved the Add-to-Cart DPAs into their own campaign separate from the “View Content” DPAs. There are pros and cons to this approach. The big benefit to separating things out is that it’s easier to see what’s happening, what’s working, and what’s not—because your data is all separated. But the downside is that your data is all separated. In other words, your data becomes more fragmented and the Facebook algorithm can’t optimize for conversions as efficiently as it could if your data was all together in one place. #2: We would have been more patient with poor-performing ads. When we initially took over for Kerotin Hair Care, the campaigns were very close to break-even. And as a media buyer, that’s the equivalent of standing on the edge of a cliff. That might sound like a reasonable reaction, but in hindsight we should have been more patient and given those poor-performing campaigns a week or even 10 days before making any knee-jerk reactions. #3: We would have made an agreement with the client’s optimization team. Kerotin’s team works hard on their website, making frequent changes and tests to the landing and product pages. Of course their goal is to improve performance. But when you’re doing this kind of conversion rate optimization (CRO), long-term improvement often comes at the cost of a short-term dip in performance. In other words: anytime we noticed a campaign’s performance start to go south, it might have been because of a change they’d made to the landing page. Which means that there really was no reason for us to change the ads. Today, we make a point to get on the same page with all our clients’ web teams and make an agreement to keep an open communication anytime they are making a change to the website. This way we’ll know that a change in performance is due to the website (not the ads), and we can make sure that their website optimization and Facebook ads are on the same page. Reading this case study, you might be surprised at just how small some of our changes were. In some cases, all we did was tweak the copy and adjust the date range for our DPA ads. And yet the results were HUGE—in some cases creating a five-fold improvement in ROAS and CPA. But of course, there’s a lot more work that goes into these optimizations than meets the eye. In a manufacturing plant, a valuable piece of machinery breaks. The plant can’t operate without it, so the owner calls in a repairman right away. The repairman shows up and carefully inspects the machine. Then he takes out a little hammer and gently taps the machine in one very specific location. Immediately the machine starts working again. A few days later, the repairman’s bill arrives for $500. And this principle can apply to a Facebook campaign, too. In some cases, all it takes to skyrocket your performance is a handful of small tweaks to your campaigns. That’s where the real value—and the real challenge—lies. That’s why we put so much emphasis on recruiting, training, and retaining the absolute best Facebook & Instagram media buyers in the world. 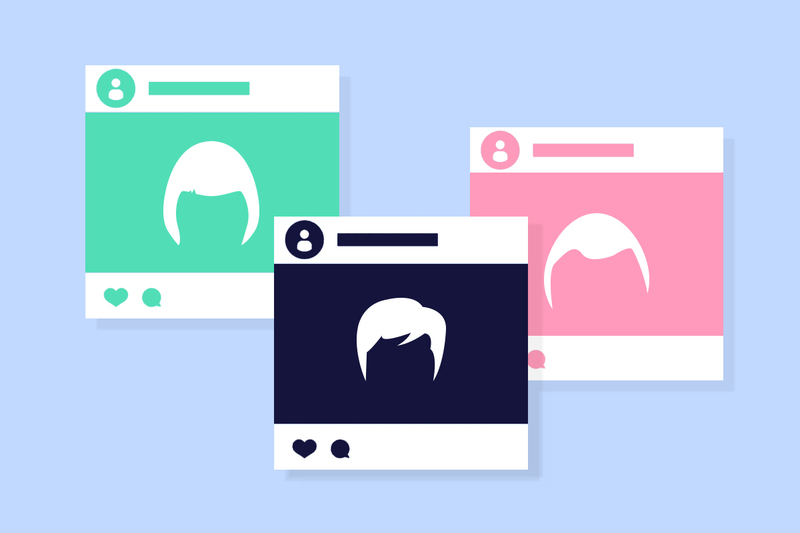 And now you can chat with one of them — we’ll put you in touch with a Facebook expert who can figure out exactly “where to tap” in your campaigns to help you finally scale up your business at a profit.